Those of you who read my blog regularly will know that I really enjoy taking a small piece of historical evidence and turning it into a story about someone’s life. Well I’ve been at it again. I had ten minutes to kill in Knighton churchyard and spent it taking photographs of the gravestones of former Clarendon Park residents. 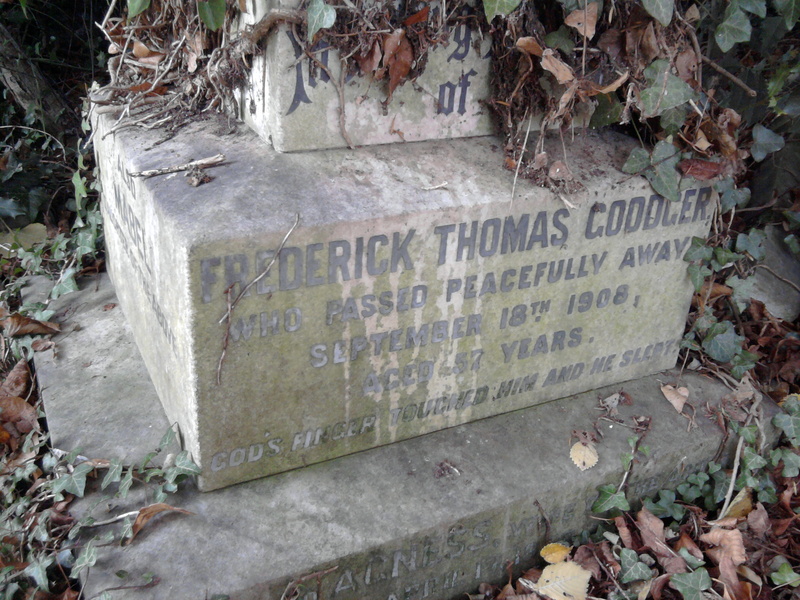 The one that most took my fancy was that of Frederick Thomas Goodger, who “passed peacefully away” on 18th September 1908 aged 57. Alongside is Frederick’s wife Agnes Mary Goodger, who outlived him by 24 years and died aged 82, still living at their former address of 33 West Avenue. 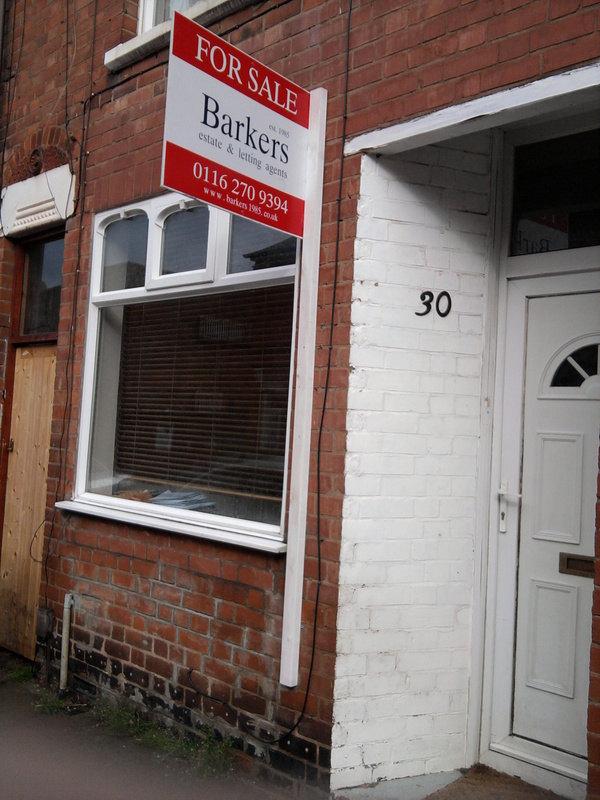 How did I know that the Goodgers were Clarendon Park residents? It doesn’t say so on their grave stone, but some time ago I made a database of all the Clarendon Park residents who were buried at St Mary Magdalene, Knighton before 1952 (there’s around 850 of them), which comes in handy sometimes. Frederick was born in Leicester in 1851, the son of a painter. He married Agnes Mary Price on 10th September 1872 at St Mary de Castro. Within a short time (from at least 1876) he had set himself up in business, as a butcher at 52 Shenton Street. 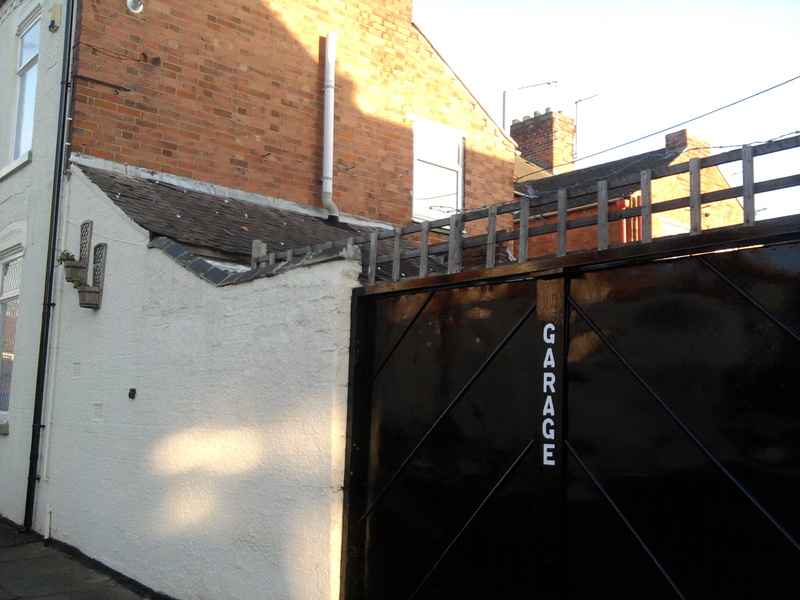 He took a loan of £100 from Sir Thomas White’s charity– which is still helping people start up in business in Leicester – in 1879, gaving him the capital to expand and improve his business, and take on new and better premises at Clarendon Park. In 1891 he occupied 35 West Avenuen with wife, children and an apprentice. 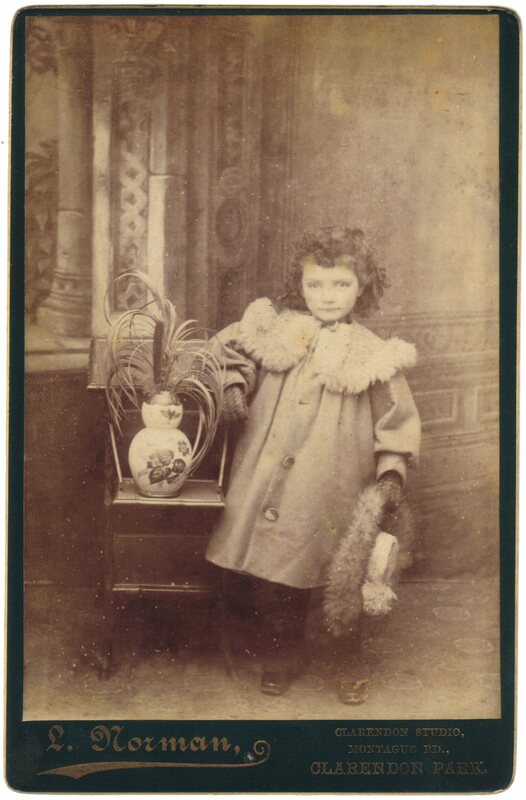 By 1901 he also occupied 33 West Avenue, which was just as his adult daughters were working as milliners and dressmakers at home and no one likes their frock and hat to smell of raw meat. After Frederick’s death, you might have expected Agnes his wife to live on the small amount left to her (£816) and her daughters’ assistance, but no – she gamely carried on the business with herself in the title role, so if you look at the trades directories of the 1910s you will find her under Butchers. Misses Beatrice and Mabel never married (they were already old-ish for marriage by the time of the War) and they continued making dresses and millinery, probably scratching out a fairly basic but respectable existence and still occupying 33 and 35 West Avenue. By the time Agnes died, there was nothing significant money-wise left to leave behind. That’s another old shop I walk past most days, and I’m glad I decided to follow up the story behind Frederick and Agnes’s gravestone. Regards, Elizabeth. The weather is just as dull as it was at home. Not much sea and rather a dirty brown. Did you come here as well as Swansea? I forget! There are some nice public gardens but small. Went to the Baptist Chapel twice yesterday. Yours with love Hannah. 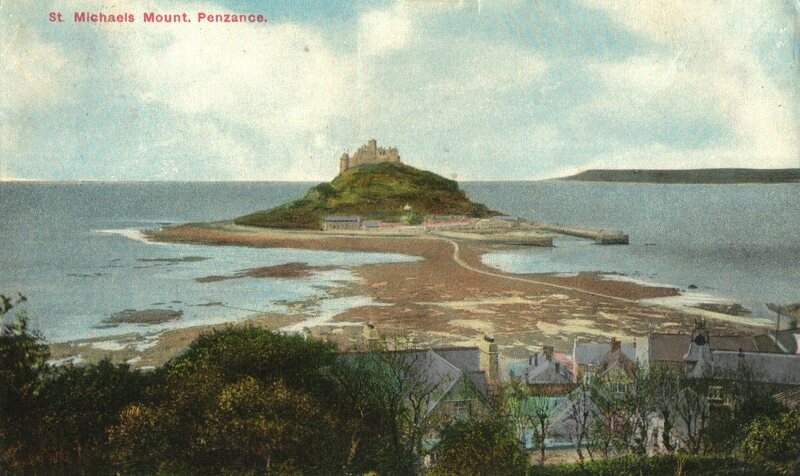 Penlee Villa, Redinnick, Penzance. Poor Hannah! I’ve been to Penzance once and it was lovely, although the sun was shining and I’ve never been a fan of large public gardens. Mrs W T Vice was Mary Eliza Vice (also nee Vice, 1857-1927), wife of William Thomas Vice (1862-1942), originally a corn miller from Blaby but by 1911 manager of flour mills for a biscuit manufacturer. They had several children: Samuel (1886), Dorothy Martha (1888-1954), Gladys Mary (1890), Hilda Geraldine (1894-1931), and Marjory (1893) who died in infanthood. 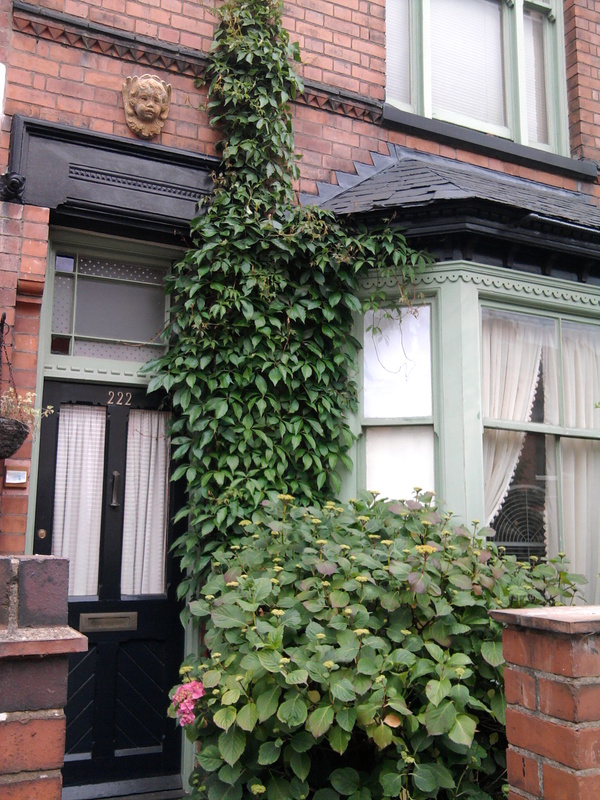 All except Dorothy lived at 222 Clarendon Park Road in 1911. I have no evidence for this, but suspect that the Hannah of rubbish holiday fame was William’s unmarried sister Hannah Eliza Ann Vice (1854-1928). Virtually all the Vice girls – no pun intended – remained unmarried, and almost the whole Vice family returned to their native Blaby to be buried in the cemetery. It’s a pity Hannah didn’t enjoy her holiday more because it was probably the last one she took for a long time. 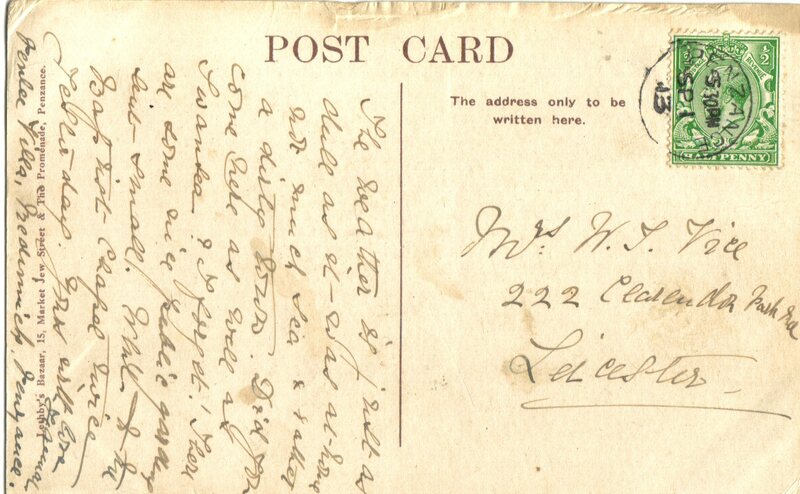 The postcard was sent on 1st September 1913, not long before the onset of World War. My mother in law is off to Penzance in a few weeks – here’s wishing her blue skies and a sparkling sea. Regards, Elizabeth. I have been having a run of good luck on Ebay this week. 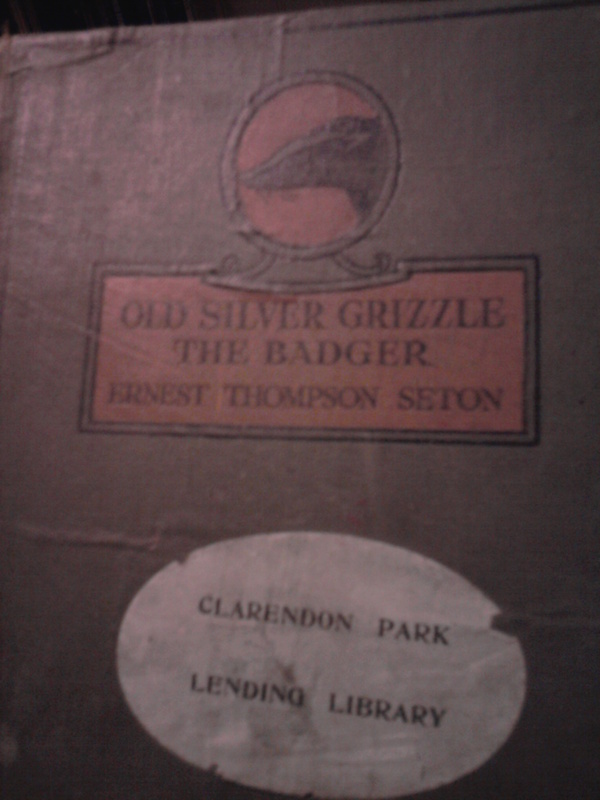 My favourite item, which arrived in the post this morning, is a copy of Ernest Thompson Seton’s Old Silver Grizzle The Badger. What makes this slightly battered edition interesting to me is that on the front is a stained, green label printed with the words CLARENDON PARK LENDING LIBRARY. Which got me thinking about libraries in Clarendon Park. Apologies for the terrible photo! Knighton branch library opened on Clarendon Park Road on 9th April 1896. In 1912 it contained upwards of 4,300 books (according to Kelly’s Directory), rising to 5,900 by 1928. Opening hours were then 6 – 9.30pm on weeknights and 3 – 9.30pm on Saturdays, reflecting the leisure hours of Clarendon Park working folk. The Chronicle reported in 1897 that Knighton library readers were more inclined to read “serious” books, especially theology and philosophy, and there were more adult readers than at other branches. It was abundantly supplied with daily papers and periodicals. 18,000 books were issued in the first year, making it a great success. A separate table was kept for ladies, and another for boys. Very sensible. Ladies and boys just don’t mix, do they? 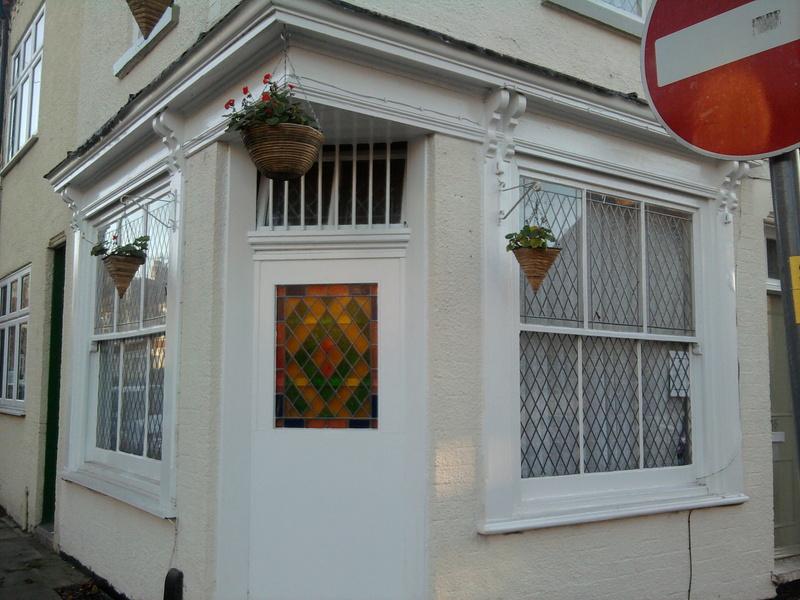 Many towns and villages had private lending libraries, often operating from small shops. In Victorian times the cost of books was so high in proportion to incomes, that most people could not afford to buy them and so used a private lending library, at least until the municipal ones were established. 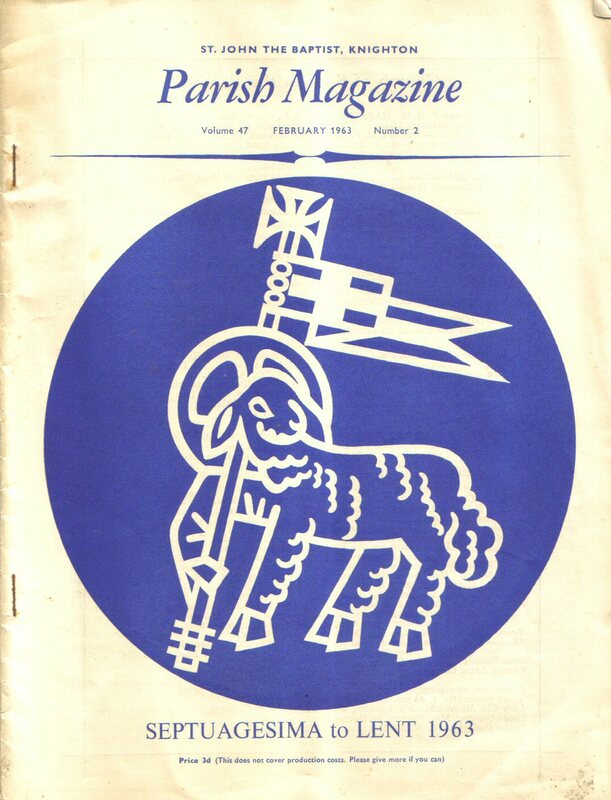 Quite a few were organised by churches, such as St Philips in Evington, where the vicar “put by” 300 or so books and started one for the poor of his parish (no doubt of an improving nature). 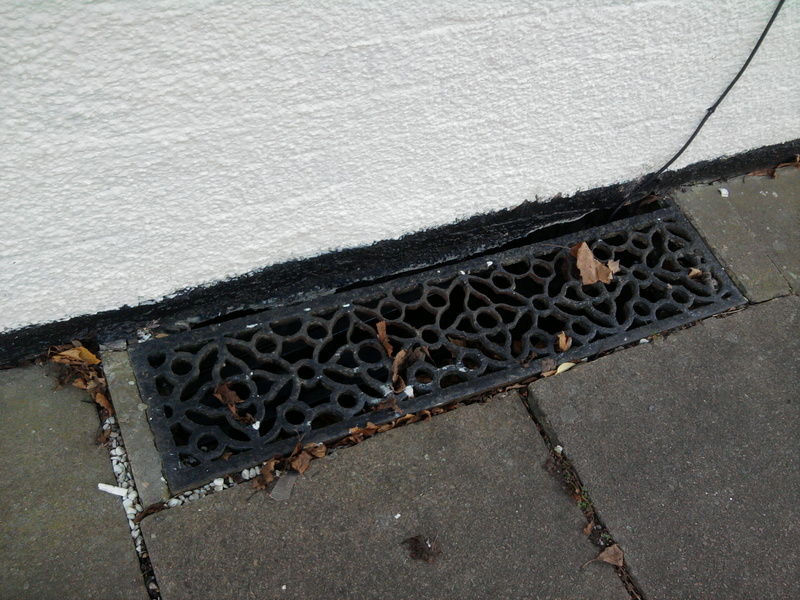 Some were established in village halls and schools. Some of these were free, and some were paid for by subscription or by individual book borrowed. 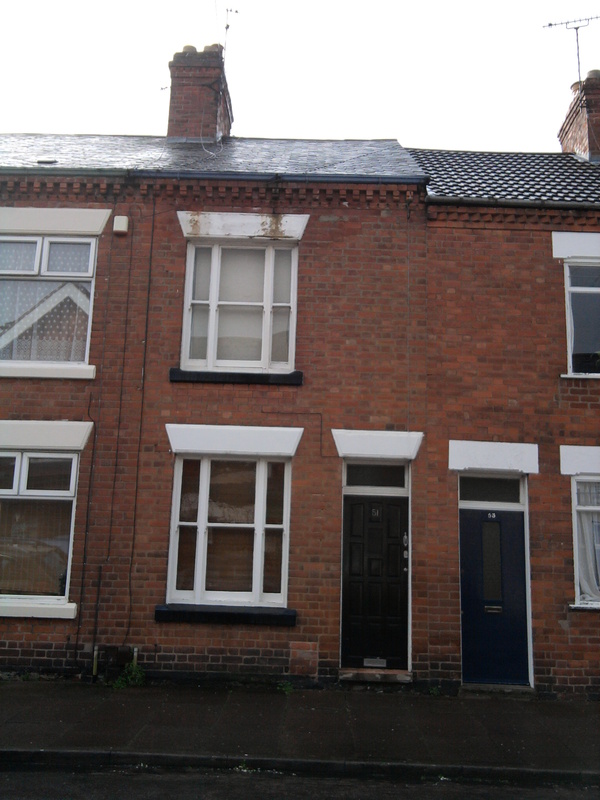 Both kinds could have flourished in Clarendon Park, with its mix of wealthier middle class and very humble working class people. None of which brings me much closer to finding out about Clarendon Park Lending Library. I’m pretty sure I came across a reference to it in a city directory at the county archive…..but I won’t get a chance to check until next week. Oh, and Catherine Hayes, of The Pebbles, Burmarsh circa 1982 with the red felt tip pen – you are a naughty girl for writing in your books! Regards, Elizabeth.